Giraffes Can’t Dance is the favorite book of Richard “Richie” Montgomery III, who is 2. “It’s about a little giraffe who goes to the jungle dance with the other animals. They tell him giraffes can’t dance, so he goes off and finds his own rhythm,” Charisse Montgomery, Richie’s mom, said. Meet the Montgomerys: Charisse, Richie and Richard. Charisse and Richard Montgomery II have been working on their routine since Richie arrived Aug. 12, 2011. Richie, who weighed 6 pounds and 6 ounces and measured 19 inches, spent 31 days in the neonatal intensive care unit. “My sister also was born with similar muscle weakness, so that was our point of reference. She was diagnosed with muscular dystrophy at a young age, although we later learned that she had a myopathy, which is similar but sometimes harder to identify,” Charisse said. Richie’s diagnosis: congenital fiber-type disproportion myopathy. “The simple explanation is that he has a disproportion between the types of muscle fibers that fire and give you strength versus the kind that stay more relaxed. The disease results in severe weakness of all the muscles in the body,” Charisse explained. At the time, Charisse and Richard, who both work in the College of Pharmacy and Pharmaceutical Sciences, were pursuing degrees in the Judith Herb College of Education. Charisse and Richard Montgomery II posed for a photo with their son, Richie. They embraced more learning for their son. “We had to become experts on every aspect of his care. Having a child with a tracheostomy tube and a ventilator is a whole educational process by itself. We had to learn every aspect of care for him and all his medical devices and equipment in order to bring him home,” Charisse, scientific editor and college communicator, said. “Our education has not just occurred in the classroom. Our educational backgrounds allow us to approach Richie’s health issues as an academic project of sorts,” she added. “The combination of my wife being a former English teacher and me having a master’s in early intervention/education works well for us. We create lesson plans, and we talk a lot about what our goals are for him,” Richard, assistant director of the bachelor of science in pharmaceutical sciences degree program and director of the Institute for Professional Advancement in Pharmaceutical Sciences, said. After being in and out of the hospital during his first few months, Richie was ready to be home. “We decorated his room with a rocket theme, complete with glow-in-the-dark stars and planets,” Charisse, who received a master’s degree in English from UT in 2010, said. A rocket-shaped chalkboard on the closet door outlines the activities for the week: phonics DVDs, ABC flashcards, educational iPad apps, sensory play, reading books, coloring, music. Nurses who care for Richie during the day while the Montgomerys are at work follow the plan. “Because we both have backgrounds in teaching, we probably overwhelm his little world,” Charisse said and laughed. As first-generation college graduates, the Montgomerys are committed to education. They started signing with their son at birth to work on language development. “His recent test to prepare for preschool showed that on some aspects of cognitive development, he’s at age 4 and a half. He’s very smart,” Richard, adviser for the Student African-American Brotherhood, said. 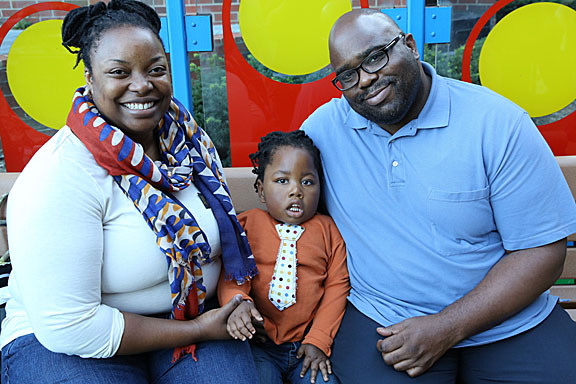 “Richie doesn’t have the expressive language that kids typically do at his age because he’s had a trach since he was 2 months old, and he was not able to vocalize at all until just a few months ago with the help of a speaking valve for his trach,” Charisse said. But he’s catching up fast — almost as fast as he drives. “In December, he got his first motorized wheelchair, and he loves to drive. He drives like a 2-year-old, mostly into the furniture,” Charisse joked. “I’ll say, ‘Hey Richie, you’re going in circles.’ And he’ll be like, ‘Woo! I’m going in circles!’” Richard said and laughed. 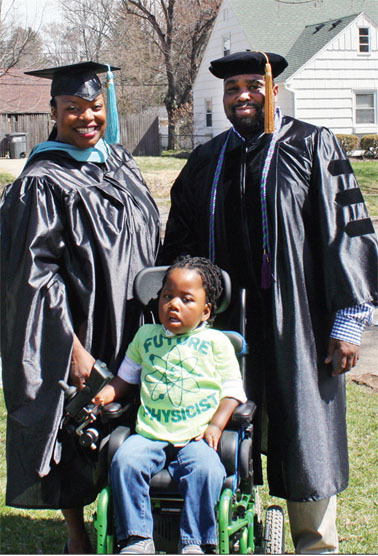 While they’ve been teaching their son, the couple finished their degrees. This Saturday, Richard will receive a doctor of education degree in educational leadership, and Charisse will earn a master of education degree in educational psychology. Richie will be in the audience. They remain committed to Richie’s cognitive development in honor of Charisse’s sister, Chavon Hodges, who passed away at age 27 in 2012. “So that’s our hope, that we prepare him minimally for one doctoral degree; he can have two if he wants,” Richard said. This entry was posted on Wednesday, April 30th, 2014 at 4:10 am and is filed under Alumni, Features, Pharmacy and Pharmaceutical Sciences, UToday, — Judith Herb College of Education .